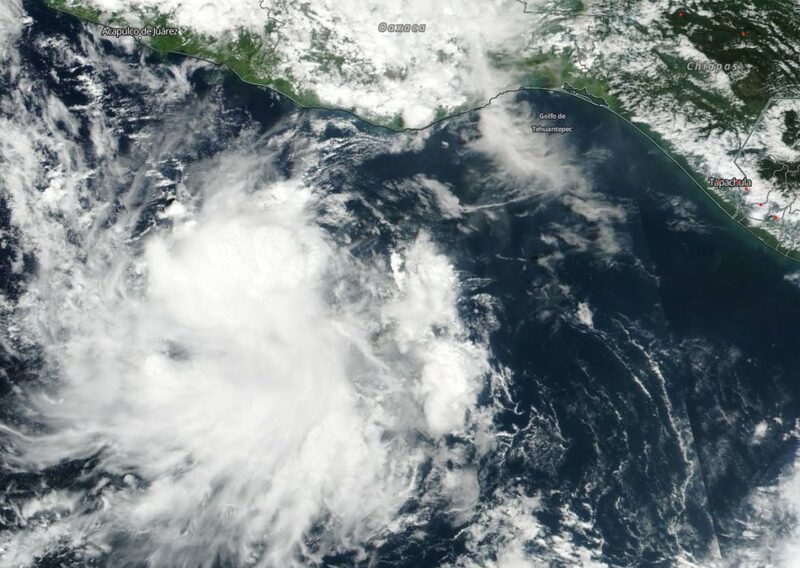 NASA-NOAA’s Suomi NPP satellite passed over the Eastern Pacific Ocean and captured a visible image of the small tropical storm named Vicente. On. Oct. 21, the Visible Infrared Imaging Radiometer Suite (VIIRS) instrument aboard NASA-NOAA’s Suomi NPP satellite passed over Vicente and captured a visible image of the storm. VIIRS showed that the storm was small in diameter. Tropical-storm-force winds extend outward up to 45 miles (75 km) from the center. Vicente appeared less organized in the image than it did hours earlier. On Oct. 22 at 11 a.m. EDT (1500 UTC) NOAA’s National Hurricane Center (NHC) in Miami, Fla. noted that the center of Tropical Storm Vicente was located near latitude 14.9 degrees north and longitude 100.8 degrees west. Vicente is moving toward the west-northwest near 12 mph (19 kph) and a turn to the northwest is expected today followed by a turn to the north-northwest on Tuesday, Oct. 23. Maximum sustained winds are near 45 mph (75 kph) with higher gusts. Weakening is forecast, and Vicente is expected to become a tropical depression by tonight or Tuesday. On Oct. 22 although there are no coastal watches or warnings in effect, the NHC cautioned that interests along the southern and southwestern coasts of Mexico should monitor the progress of Vicente. On the forecast track, the center of Vicente is expected to approach the southwestern coast of Mexico on Tuesday, Oct. 23. The cyclone’s circulation is expected to dissipate near the southwestern coast of Mexico by Wednesday, Oct. 24.